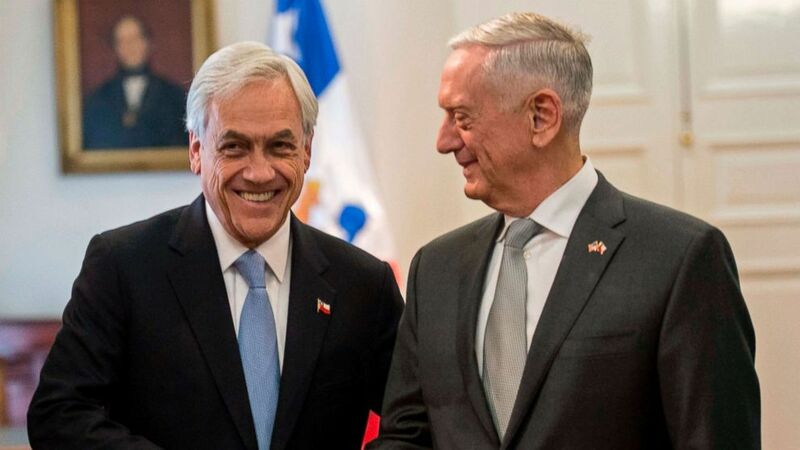 U.S. Defense Secretary Jim Mattis and his Chilean counterpart have signed an agreement pledging closer cooperation in combating cyber threats. Mattis and Defense Minister Alberto Espina held a signing ceremony Thursday after meeting to discuss a range of security issues, including military exercises and cooperation in science and technology. Cyber defense is a topic of growing interest throughout the Western Hemisphere. Banco de Chile, one of the country’s biggest commercial banks, has said a hacking operation robbed it of $ 10 million in June. Santiago was the fourth stop for Mattis on a tour of South America that began in Brasilia on Sunday. He also visited Rio de Janeiro and Buenos Aires and is scheduled to hold talks in Bogota, Colombia, on Friday.